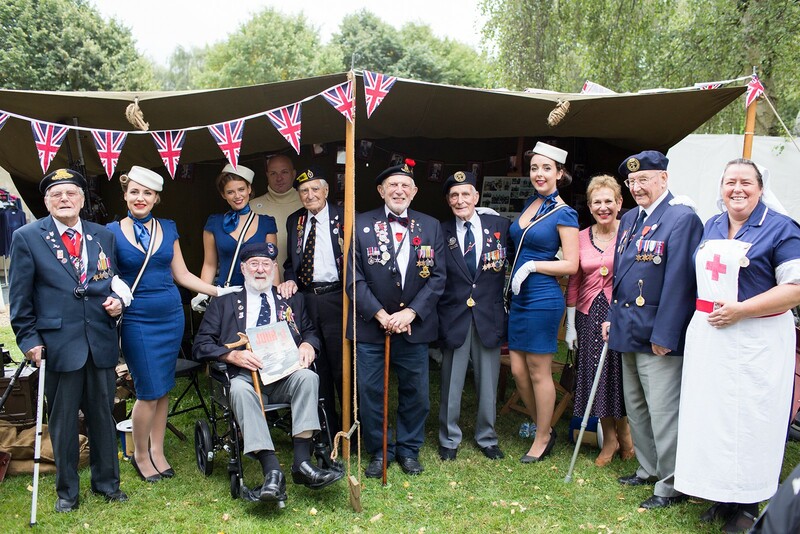 Having been invited to attend the Goodwood Revival twice already in 2014 and 2015, we were surprised and honoured to be asked to be their official charity of 2016! 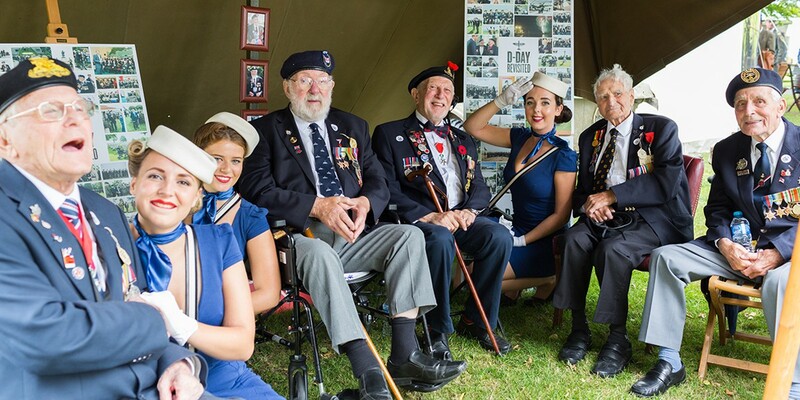 We brought 22 Normandy veterans to the event from all over the country, some of whom had visited with us before and some who were attending for the first time. In this year’s group were: Arthur Palmer, John Dennett, Francis Diffell, Gordon Drabble, Charlie Barnes, Patrick Churchill, Bill Ridgway, Bob Laverty, Neville Foote, Richard Llewellyn, Ron Minton, Richard Hughes, Bill Pendell, Joe Cattini, Denys Hunter, Bob Reeves, Douglas Austin, Len Buckley, Bill Harrison, Ray Shuck, Nick Rumble and Alf Bradshaw. The event took place over three days from the 9th – 11th September. 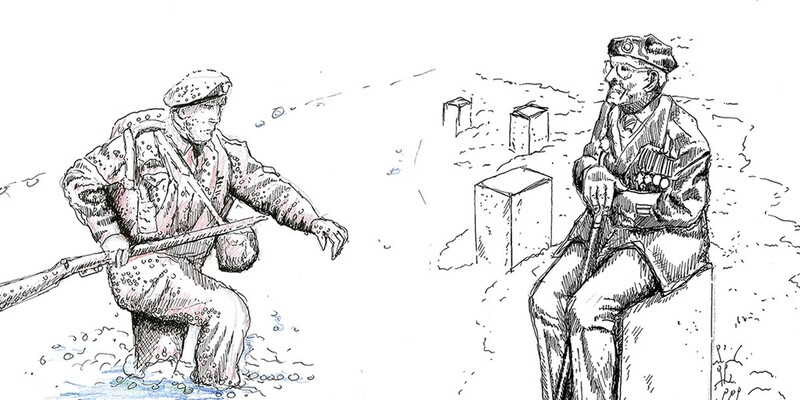 On the first day we were a small contingent of just 7 local veterans and their companions. We set up our WWII themed base next to the Goodwood Shop early that morning, whilst our guests of honour headed over to the Pilot’s Club for a bacon bap and a cuppa! As the crowds poured in more and more people came over to chat to the veterans about their wartime experiences and recent visits to Normandy. We always love seeing members of the public make such a fuss of our war heroes on home soil. On Saturday and Sunday we were 22 veterans strong, but unfortunately the weather was not on our side. The rain was relentless, but like the troopers they are the veterans stuck it out with a few welcome breaks in the Pilot’s Club. Sunday was much better and everyone was free to wander and explore the event at their leisure, making good use of the Goodwood Buggies! 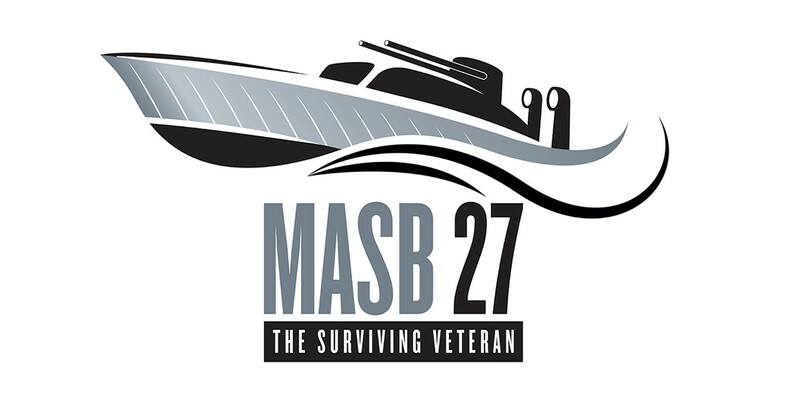 Throughout the three day event volunteers were collecting donations for D-Day Revisited – specifically for the MASB 27 Restoration Project, which began this Summer. It was humbling for us to see how keen so many of the veterans were to help out as well, handing out flyers and spreading the word about who we are and what we do. We are so very grateful to them. The interest and support from the general public was fantastic and we met some wonderful people who were keen to share their own family’s wartime stories as well as learn from our veteran friends. Carver Coaches for looking after us all so well as always! MASB 27 Project Foreman, Lee Mottrom, for giving up his weekend to help us fundraise. Louise Brown, Sarah Blunden and the whole Goodwood Team for inviting us to be the official charity of the 2016 Revival event. 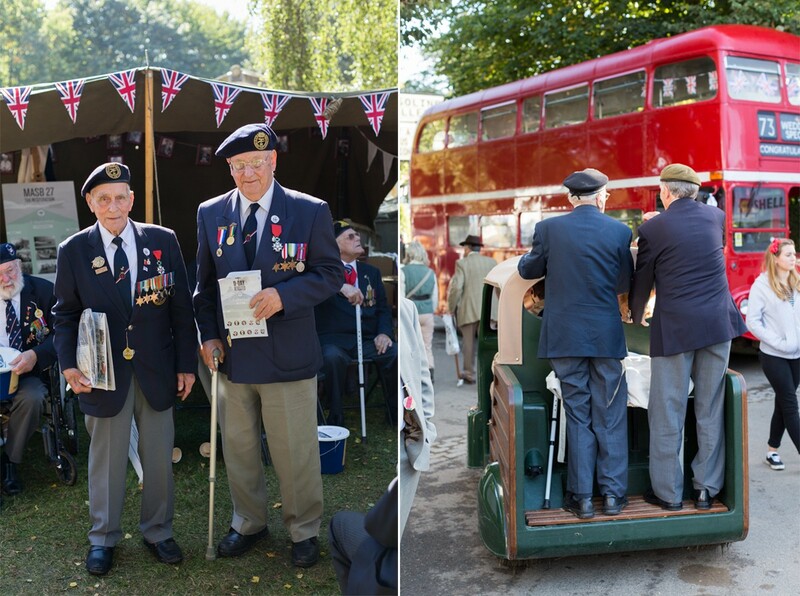 All our Veterans and their companions were treated like VIPs as is always the case at Goodwood! We are extremely grateful for their excellent hospitality. Kate Higton and the Richard Burns Foundation for helping us to make the very best of the fundraising opportunity and for allowing us to make use of their coffee and tea facilities all weekend! 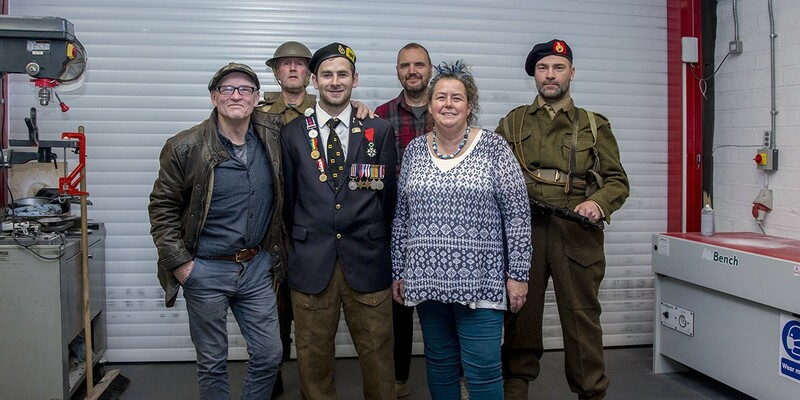 The Goodwood Team kindly continued their support for D-Day Revisited by raising further funds on our behalf at their Christmas party event in December. Thanks to so many exceedingly generous donors we reached a total sum raised of £73 905. This income gives us a new responsibility to crack on with the MASB 27 restoration and do the very best job we can. The Portsmouth Naval Base Property Trust is engaged with us in this project and keen to record the work being done. Our expectation is to recover this unique wartime gunboat for future generations and to one day see young cadets spend time on board. Tomorrow’s youngsters will get a real sense of those challenging times; see the simplicity of accommodation, operate the gun turret and feel the defencelessness of these wooden high speed boats, known then as “Spitfires of the Sea”.